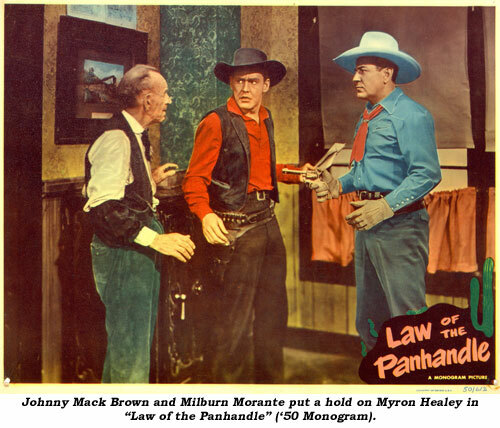 Beginning with “Hidden Danger” at Monogram in 1948 opposite Johnny Mack Brown, Myron Healey instantly became one of the best, most recognizable and most frequently seen heavies in the waning days of the B-western and the burgeoning days of the TV western. His stern good looks and rich deep voice made him a memorable western heavy. Myron Daniel Healey was born June 8, 1923, in Petaluma, California, the son of Robert and California (Penney) Healey. His father was a noted proctologist and sportsman who numbered among his friends renowned horticulturist Luther Burbank who became Myron’s godfather. Myron’s mother was head of the local Red Cross during WWI, a three term president of the Petaluma Women’s Club, a two term president of California’s 14th District PTA and a writer on education and medicine. acted in roadshow productions as well as legitimate theatre. Soon he was studying acting with noted teacher and Russian actress Maria Ouspenskaya. In 1943 he was signed to a term contract by MGM. Later in ‘43, Myron volunteered for training as an Air Force Cadet, graduating from the U.S. Army Aviation Corps. During WWII, Myron served with the Air Corps, seeing combat in France and Germany while flying with the 323rd Medium Bomber Group and B-26 Martin Marauders. He was a navigator and bombardier being twice awarded the Air Medal and Nominated DFC. After the war he served in the U.S. Air Force Reserve as Motion Picture Technical Officer, Aerial Observer and Information Services Staff Officer. He retired as a Captain in 1962. Myron resumed his film career in 1946 with Abbott and Costello’s “The Time of Their Lives” and “Crime Doctor’s Manhunt”. 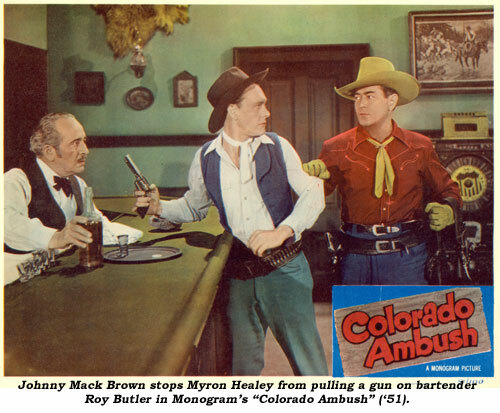 His first western role was a bit in Glenn Ford’s “Man From Colorado” (‘48 Columbia). 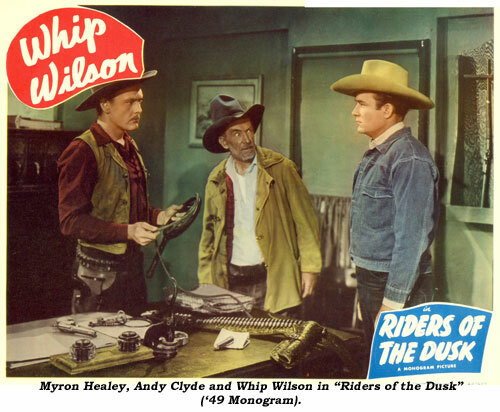 The same year he made “Hidden Danger” with Johnny Mack Brown and immediately became a staple in the Monogram westerns of Brown, Whip Wilson and Jimmy Wakely. 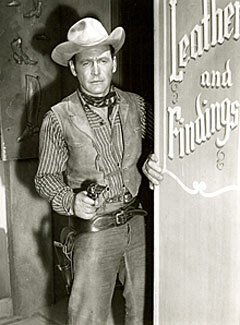 As the TV western entered the western landscape, Myron was there, working in over 225 shows from ‘50-‘85. He was a “regular” heavy on all of Gene Autry’s Flying-A productions—“Gene Autry Show”, “Range Rider”, “Annie Oakley”, “Buffalo Bill Jr.”, “Champion”. He also fought the law on “Roy Rogers”, “Kit Carson”, “Wild Bill Hickok”, “Cisco Kid”, “Rin Tin Tin”, “Judge Roy Bean”, “Cowboy G-Men”, “Lone Ranger” and others, easily graduating to the adult westerns of “Bat Masterson”, “Wagon Train”, “Cimarron City”, “Rawhide”, “Deputy”, “Riverboat”, “Tales of Wells Fargo”, “Laramie” and others—gradually sliding into more character oriented roles. When Douglas Fowley was unavailable for a year, Myron took up the role of Doc Holliday on “The Life and Legend of Wyatt Earp” from ‘58-‘59. 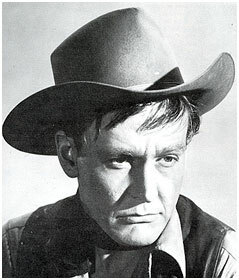 His final TV role was on “Fame” in 1985, spoofing the B-westerns slightly as Broncho Bob. 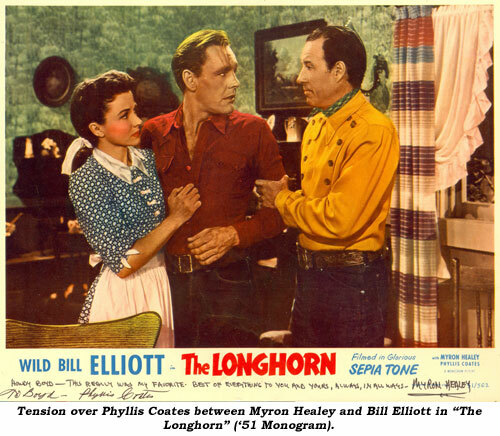 During his B-western days, Myron found time to write several screenplays including “Texas Lawman” (‘51), and “Colorado Ambush” (‘51). Myron only worked in two serials, as a heavy in “Roar of the Iron Horse” (‘51 Columbia) and as co-star to Phyllis Coates, in Republic’s “Panther Girl of the Kongo” (‘55). In between film and TV assignments, Myron served as a director for the Ebell Playhouse and Santa Monica Playhouse. He also appeared in a number of plays in the L.A. area, including “Of Mice and Men”. Healey once told me he was married and divorced “several” times. His documented wives include Ann Sumney (‘40-‘49) with daughters Christine and Ann; Elizabeth Mary Erric (‘66-‘68) with a daughter Mikel; and Adair Jameson (‘71-‘72). 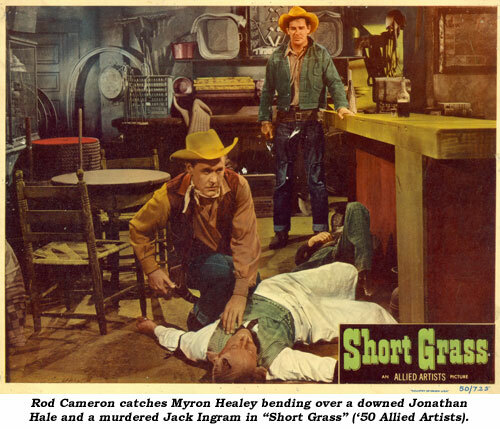 Myron Healey, one of the Top 10 western screen badmen, received a Golden Boot Award in 2000 attesting to that fact. He died at 82, December 21, 2005, of natural causes at a Simi Valley hospital.